In 2005 I tried raising money to develop a platform for connecting people with their neighbors, public services, politicians and deliver personalized news, real-estate and other high-value content and services. At the time I was the sole breadwinner with three small children rapidly going broke after working at a struggling startup so I shelved the concept and found a job. And then just the other day I discovered that my city is now using Nextdoor as a news, communication and civic engagement platform. After reviewing their vision, funding and penetration I believe Nextdoor is now positioned to execute on what I envisioned 12-years ago and revolutionize local news & civic engagement. So instead of worrying just about Facebook, journalists need to be thinking about their Nextdoor strategy. So what makes Nextdoor special? Their use of mapping-technologies to mirror and connect physical communities. 2. Building civic engagement tools to enhance communication between public agencies and the public they serve. How is that different from Facebook and local media? Traditional News approach: Journalists curate everything and publish to non/low-interactivity platforms so impossible to connect and hear directly from neighbors, politicians and public entities. Journalists and sections may be focused on specific communities but since space and journalists are limited, features very little actual local news/information. Email, Facebook & Twitter: You can connect and engage directly with other community members, government and politicians but connecting is extremely inefficient as you need to find and connect one-at-a-time with each person or organization. Also since birds of a feather flock together it leads to people primarily connecting and engaging with friends and folks who look and sound like you. And neither provides sophisticated civic-engagement tools. Next door provides a much more efficient GIS/ address-based platform that automatically connects you with your neighbors and public agencies. Enter your address, and then through the magic of geocoding and mapping software, Nextdoor finds the city and neighborhood you reside in, applying physical geography to the virtual world. Next they provide tools specifically designed to connect public agencies they serve. Delivering truly-localized/personalized news and engagement based on the many different political and civic spaces/boundaries you live in. You belong to not just a specific neighborhood and city but to many geographically-defined government and civic areas, e.g. City council districts, county council districts, public-school attendance zones, state and federal representative districts, public-utility, non-profit and business-service areas, etc. Nextdoor by using mapping technologies, can now connect you with not just your local police but all of your geographically-specific political, educational, business and non-governmental organizations. Instead of landing on either a generic screen or an information bubble of an algorithm-chosen feed, you can view both news stories and updates from your elected officials, public servants, favorite non-profits and local businesses. And news orgs could either integrate or build their own geo-enabled platform and deliver personalized news to you. So instead of just getting a story about the city council, you could see exactly how your representative voted. What does this mean for journalism and news orgs? The opportunity: A new platform for delivering local news to a built in and engaged audience. One of the reasons Patch failed and why local news sites struggle is that the World Wide Web is organized around interests, size and discrete facts, not geography. Entering your address in Google displays info about your specific house but little about your neighborhood. Enter your city and it tells you only information at the city level. Go to your local news site and you may get the option for info about your local neighborhood but almost nothing about regional, state and national decisions with local implications and participation. A geo-enabled information architecture using real-world boundaries provides an entirely new method of discovery and organizing information. And this represents a huge opportunity for journalists to deliver localized content on the Web to a built in audience via Nextdoor. The threat: It also represents another threat to local publishers that don’t adopt a geo-enabled platform and approach to news as they lack the personalization and integration capabilities of Nextdoor. After all, much of what passes as local news involves public affairs announcements, and now that residents can easily get that info direct from the source, it’s one less reason to subscribe or visit a local news site. Nextdoor also represents a new competitor for advertising dollars, further eroding the economic model for local news, especially since advertisers will be able to target down to the specific address level. Having worked for a real-estate information service provider, knowing a users’ address enables you to target them for all sorts of mortgage, insurance and home-service products specific to the house, e.g. you can see when their house was refinanced and target them with refinancing offers with fairly solid info about the interest they paid vs. now. So what will Nextdoor do next? Build more and more integration points into local public services and political establishments, so Nextdoor becomes your one-stop shop for civic engagement. Provide two-way communication and organizing tools to enable residents to give feedback and create conversations with both their neighbors, their elected officials and other public-service agencies. Allow media partners to post their content on the site and enable them to leverage the platform to deliver personalized news in exchange for a revenue share. And since Nextdoor controls the platform, they will determine the deal structure. What should news organizations do? Decide whether they want to be content organizations feeding other people’s platforms or whether they want to be information technology organizations that provide civic engagement and intelligence solutions. If you want to just provide content, then focus on trying to be the first on your block to negotiate a deal so you don’t get locked out. If I were Nextdoor, I’d be putting out RFPs and getting news orgs to compete for placement. If you want to control your own destiny and compete from strength, integrate geo-enablement capabilities into your content management systems, develop a geo-enabled information architecture and geographically-discrete content. If you’re interested, let me know and I’d be happy to explain in more detail how news orgs can leverage geo-personalization to increase both site and civic engagement. 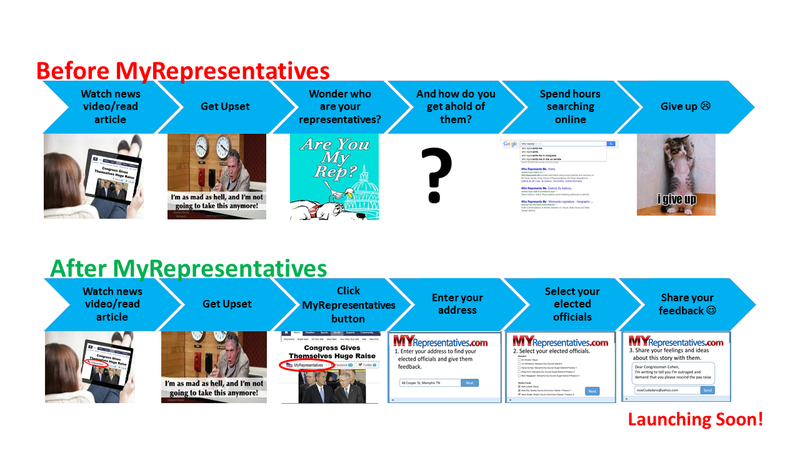 Embed the MyRepresentatives feedback button in your site or blog, so whether you’re a news organization, non-profit or advocacy organization, you can make it easy for your audience to get engaged. The goal is to transform journalism from just presenting information to providing civic engagement tools that make it easy for readers/viewers to take action. After all, isn’t the whole point of journalism to help drive change? With MyRepresentatives you can embed the MyRepresentatives feedback button on your site, just like you do links to Twitter and Facebook, and you’re done! Best of all it’s free! The entire site has been developed as an after-hours non-partisan public-service project, but that doesn’t mean we won’t accept donations. So stay tuned! And feel free to contact us for more details about how you can integrate MyRepresentatives into your site.